Optional: From Madurodam, go to Rotterdam and stay overnight. Spend a day in Rotterdam and leave for Amsterdam in the evening. Travelers from U.S., used to driving long-distances on U.S. Freeways, should note that distances in Netherlands are in kilometers, which makes it faster to reach as compared to in miles, so make sure to keep an eye for your exits. We assume that you’d be driving (a small hutchback will do!) to all the destinations. Having a GPS device always helps, especially when the distances are less and it’s tough to read the (sometimes) long Dutch street signs while driving. Directions to big cities like Amsterdam and Rotterdam are shown to and from the Centraal Stations. For journeys more than one day, you may plan to stay over in a city and the directions to your hotel/hostel may vary. This trip details some of the most visited tourist spots, that are also covered by bus tours from Amsterdam or Rotterdam; hence a one-day trip. Specific details about things to do and see in big cities (Amsterdam and Rotterdam) are not included in this itinerary. The tourist spots in these cities are too many and may take more than a day to cover them all. Most of the museums and tourist spots have discounted prices with the Holland Pass. We try our level best to share current prices for the destinations and everything else, but we are humans after all, we may make mistakes. All prices mentioned here may have changed and it’s best to do your research for the updated and latest prices and rates. Please leave a comment if you find a glitch or know of any excellent promotion that we may have missed. Thank you! Volendam is a popular tourist attraction in the Netherlands, well-known for its old fishing boats and the traditional clothing still worn by some residents. The women’s costume of Volendam, with its high, pointed bonnet, is one of the most recognizable of the Dutch traditional costumes, and is often featured on tourist postcards and posters (although there are believed to be fewer than 50 women now wearing the costume as part of their daily lives, most of them elderly). There is a regular ferry connection to Marken, a peninsula close by. Volendam also features a small museum about its history and clothing style, and visitors can have their pictures taken in traditional Dutch costumes. In Volendam, bus #110 and #118 from Amsterdam and Monnickendam drops passengers on Zeestraat, just across the street from VVV (www.vvvvolendam.nl; mid Mar-Oct 10am-5pm Mon-Sat; Nov-mid Mar 10am-3pm Mon-Sat). From VVV, it’s a 5-minute walk to the waterfront, from where there’s a ferry service to Marken (summer only). Today Edam is a town with authentic 17th century architecture, convincing proof of its rich past. When walking along the old streets and quiet canals, one can easily imagine how it was in a Dutch town centuries ago. Well preserved gables, squares, bridges and monuments capture and hold the attention of the visitor. A stroll takes one past the tea-houses on the ‘Schepenmakersdijk’, the leaning Carillon tower (1561), the historic museum with the floating cellar, the Dam, the Town hall of Edam to the Great Church. This is one of the largest churches in the Netherlands. It has an extraordinary collection of richly coloured stained glass windows dating from the 17th century. 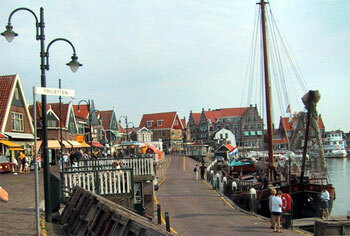 Edam has more: cozy shopping streets and nice terraces where one can enjoy a drink or a snack. There is the ‘Strandbad’ camping on the edge of the IJsselmeer, countless watersport fans from far and near have found their way to this camping site and public swimming area, just outside the centre of Edam. The Zaanse Schans Information Centre is situated in the reception area of the Zaans Museum and is open daily from 09.00 to 17.00 hours. The Zaanse Schans is open daily throughout the year. There is no entrance fee, however some of the attractions are during the winter months only opened in the weekends. For further information please contact the Zaanse Schans Information Centre. There were once more than a thousand windmills situated alongside the Zaan, six of which can now be found at the Zaanse Schans: two oil mills, a mustard mill, a paint mill and two saw mills. A visit to a working industrial mill is an unforgettable experience. The Zaanse Schans has a varied selection of interesting museums. Information about opening times is available at the Zaanse Schans Information Centre in the Zaans Museum. Other museums in the immediate area include the Zaans Museum at the Zaanse Schans, the Honig Breethuis in Zaandijk, the Windmill Museum in Koog aan de Zaan and the Tsar Peter House in Zaandam. A number of fascinating traditional Dutch crafts are practiced at the Zaanse Schans. There are demonstrations of clog-making, Delftware painting, pewter-casting and cheese-making. Shops selling textiles, pottery, cheese, mustard, clogs, postcards and many other items are situated in a variety of historic Zaanse warehouses and barns. Why not combine your visit to the Zaanse Schans with lunch or dinner in ‘De Hoop op d’Swarte Walvis’ restaurant? Or try ‘De Kraai’ restaurant for a light lunch or pancakes. The MuseumCafé in the Zaans Museum offers not only refreshments but also wonderful views over the magnificent Kalverpolder and the windmills along the Zaan. Boat tickets are available at the Zaanse Schans Information Centre or at the ship owners company. There are two blocks of public toilets available at the Zaanse Schans. Cost € 0,50 per visit. Facilities for the disabled and small babies can be found at the Zaanse Schans Information Centre in the Zaans Museum. They takes care of any items lost or found at the Zaanse Schans. There is also a cloakroom for visitors and lockers for valuable articles. Only four stations (20 minutes) by train from Amsterdam Central Station. Take the stop train direction Alkmaar to Koog-Zaandijk. From the station simply follow the signs to the Zaanse Schans. It is 5-minute walk from the station to the ferry. Pedestrians will be able to reach the Zaanse Schans by a small ferry operating in the area at 10-minute intervals throughout the day. 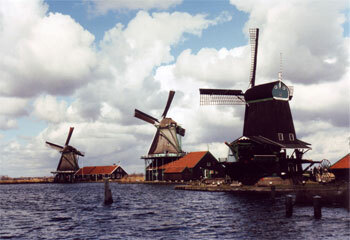 It is 5-minute walk to the Zaanse Schans and 10-minutes to the Zaans Museum. There is an excellent bus service operating from Amsterdam Central Station direct to the Zaanse Schans. Bus #91 leaves Amsterdam Central Station twice hourly and stops at the St. Michael College next to the Zaans Museum and Zaanse Schans. Take bus 91 from Amsterdam Central station, it stops right outside, and costs 5 euro return. The buses leave at 25 and 56 minutes past the hour (between 9-4) and the trip takes 50 minutes. To come back the bus leaves from the same bus stop – right outside Zaanse Schans. Delicious cheese – A taste of the Netherlands: This replica of an original farm from the village of Oostzaan was built in 1988 and has been converted into a cheese farm. Different types of Dutch cheese are made here daily. Cheese making demonstrations are conducted throughout the day and are available in many languages. Best of all is the possibility of being able to taste the end product! Keukenhof (Dutch: Kitchen garden), also known as the Garden of Europe is situated near Lisse, Netherlands, and is the world’s largest flower garden. According to the official website for the Keukenhof Park, approximately 7,000,000 (seven million) flower bulbs are planted annually in the park. Keukenhof is located in South Holland in the small town of Lisse, south of Haarlem and southwest of Amsterdam. It is accessible by bus from the train stations of Haarlem, Leiden and Schiphol. It is located in an area called the “Dune and Bulb Region” (Duin- en Bollenstreek). The garden was instigated in 1949 by the then-mayor of Lisse. The idea was to present a flower exhibit where growers from all over the Netherlands and Europe could show off their hybrids – and help the Netherlands export industry (it is the world’s largest exporter of flowers). Keukenhof has been the world’s largest flower garden for over fifty years. Keukenhof is open annually from the last week in March to mid-May. The best time to view the tulips is around mid-April, depending on the weather. 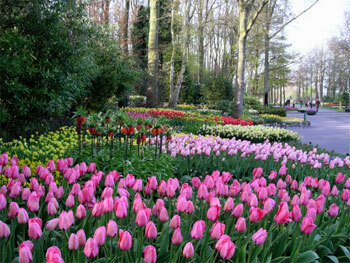 In 2009 Keukenhof will be open from March 19 to May 21. Daily from 08:00 – 19:30. Keukenhof has five restaurants, each with a terrace overlooking the park. These are self-service restaurants where you can get coffee, tea, filled rolls and hot meals. You can get a taste of Dutch cuisine the moment you set foot in Keukenhof. Why not start or end your visit with an original Van Dobben ragout croquette on a roll in the Amsterdam sandwich and snack salon or with a plate of poffertjes (mini-pancakes) in the traditional Dutch poffertjes café? This restaurant lies next to the pond, one of the most photographed locations in Keukenhof. The decor pokes fun at the traditional symbols of Holland: clogs, cows, the Dutch masters, Delft Blue and cheese. The restaurant facilities at the oldest pavilion in the park are reserved for groups and tours. The exhibitions are, however, open to the general public. You are more than welcome to come and have a look around and then chill out on the terrace where you can enjoy the view and our Coffee Corner. The restaurant can be easily converted into a conference area complete with beamer and screen. The Oranje Nassau Pavilion is situated beside the cloister garden. The restaurant and terrace overlook a veritable tour de force in landscape architecture, accentuating dune, polder and dyke, the three most characteristic features of the Dutch landscape! A long array of fountains stretching across the entire space completes the scene. The pavilion also has a board room and a workshop room. The age-old maxim that all roads lead to Rome does not apply at Keukenhof. Here all roads lead to the Willem Alexander Pavilion; the hub of the park. The restaurant’s interior reflects the trees and colours in the park in a very modern way. A warm welcome awaits you at the Coffee Corner terrace in the pavilion greenhouse. A trip to Keukenhof would not be complete without a visit to an old-fashioned bulb shed. Once you are inside, surrounded by rakes, boots, crates and spades, try out some of the tempting treats in the Beatrix restaurant. Anyone for tea? In the corner of the ‘Narrow Wood’ a small Orangery can be found which serves a wide assortment of tea with cakes and confectionery and a panoramic view across the bulb fields. Scattered throughout the park are various mobile sales units, which each have their own assortment, including herring, smoked sausage on rolls, strawberries with cream, warm ham rolls and traditional ice-cream. The bulb growing area’s Flower parade on Saturday 25 April, follows a forty kilometre route from Noordwijk to Haarlem and passes through Keukenhof in the afternoon, crossing the ‘Keukenhof Corso Boulevard’ [Parade Boulevard]. This parade is called the ‘face of Spring’ for very good reason and is the most famous parade in the Netherlands. The procession consists of about twenty floats and more than thirty vehicles all covered with flowers and decorated lavishly. A festive promotional convoy precedes the procession. Musical groups lead the procession along the length of the ‘Keukenhof Corso Boulevard’. Madurodam is a miniature city located in Scheveningen, The Hague, in the Netherlands. It is a model of a Dutch town on a 1:25 scale, composed of typical Dutch buildings and landmarks, as are found at various locations in the country. This major Dutch tourist attraction was built in 1952 and has been visited by tens of millions of visitors since then. The miniature city was named after George Maduro, a law student from Curaçao who fought the Nazi occupation forces as a member of the Dutch resistance and died at Dachau concentration camp in 1945. In 1946 Maduro was posthumously granted the honor of Knight 4th-class of the Military Order of William, the highest and oldest honor in the Kingdom of the Netherlands, because he had distinguished himself in the Battle of the Netherlands against German troops. His parents donated the money to start the Madurodam project. A visit to nearby Scheveningen Beach, the various museums in the immediate vicinity, or a cycling tour of the dunes, can be combined easily with a visit to Madurodam. Madurodam in the dark! When twilight falls thousands of tiny lights create a fairytale atmosphere in the miniature city. Many visitors come to Madurodam especially for this. 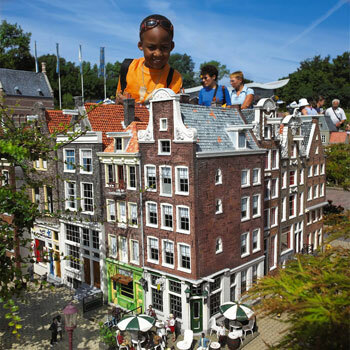 Madurodam has developed a special evening programme, to highlight this magical image. A spectacular show can be seen in Madurodam: Madurodam by Light. Every evening after sunset visitors will be submerged in a fascinating Dutch fairytale that tells the story of Hansje Brinker and the fight against the water. Madurodam uses the most modern projection techniques for this show of water, light and lasers.